First time under a tent on grass! This is going to be awesome! It's my fourth time participating in the Whyte Avenue Art Walk which is in its 23rd year. This year's festival is a lively art walk with people who braved the weather to take in some art. Friday was SO hot while Saturday was a rainy day with 7 minutes of intense storming! Sunday was beautiful and so active. Thanks to all who came out and for all the volunteers who made the festival happen. I was in a Big Event Tent in a 6' by 10' space. We made it work. 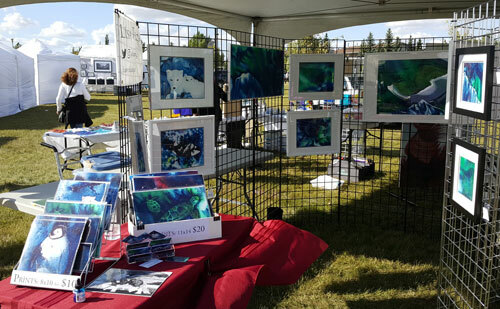 It was my first time participating in the Art In Our Park which is in its 7th year. It was wee bit windy but a beautiful day regardless. First time using my very own lime green tent. So spacious! It was my first time participating in the Strathearn Art Walk which is in its 7th year. I was close to the stage and bopped along to the live music. I will sign up for next year! All images, graphics and content within this site are Copyright © 2018 Lisa WYlie-King. All rights reserved.